Our Direct Thermal Products all have a heat sensitive coating on the face stock which enables these products to be imaged with a barcode printer and does not require a ribbon. Our product offering includes various face stocks from paper to synthetics. These products cover a wide range of applications and can be manufactured with a multitude of adhesives to meet our customers’ requirements. Non Top Coated Paper – Our NTC Direct Thermal Paper labels utilize a paper base stock to which a thermal coating has been applied. This coating enables the barcode printer to print a crisp image at average print speeds. These labels are used in short term applications such as transportation, meat and poultry processing as well as the health care industry. Top Coated Paper – Our Top Coated Paper labels are smooth, bright, white paper with a high sensitivity thermal coating. 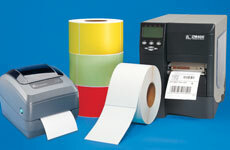 It is designed for use with low voltage print heads and is also ideal for use with high-speed thermal printers. Its special top coating provides protection to the thermal layer. Direct Thermal Tag – Our Direct Thermal Tag is an economical, high-quality product perfect for cost-competitive situations. A great value for a top-coated, medium sensitivity tag that provides excellent resistance to harmful environmental conditions. Direct Thermal Synthetic – A durable, high sensitivity, 4 mil direct thermal polypropylene film for use with high speed thermal printers. It is ideal for meat and poultry labeling, shelf marking, ski lift tickets, ID wristbands and medical labeling applications.